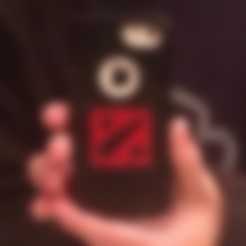 An iPhone 5c case with the Dota 2 logo on the back. Can be printed with dual extruders, but I just printed the two separately. My original plan was to just print in red and spray paint black afterwords, but after seeing rodabollo's design, I thought that this would be a better approach. Make sure that your printer's dimensional tolerances are good, I really had to sand mine down to fit.